by Chris Woodford. Last updated: December 7, 2018. Up, up, and away! If you love the idea of flying but you've nowhere in particular to go, a hot-air balloon could be just the thing. In an age when jet engines can blast you round the world in hours and rockets routinely zoom into space, floating under a big bag full of gas might seem a bit old-fashioned—but then hot-air balloons were where air travel really began. Ask most people who were the pioneers of human flight and they'll answer "The Wright brothers" without a moment's thought. But those brilliant men from Ohio were just the inventors of engine-powered human flight; two other brothers, Joseph Michel and Jacques-Étienne Montgolfier, beat them into the air by about 120 years when they developed the first practical hot-air balloons. Ever wondered how these giant floating gas bags actually work? Let's take a closer look! Photo: With a few mighty blasts from the gas burner, this hot-air balloon safely cleared these tall trees. How does a hot-air balloon work (in theory)? 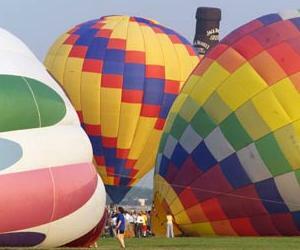 Hot-air balloons float in the sky for pretty much the same reason that boats float on the sea. A boat floats because it's supported by the water beneath it: the weight of the boat (pulling downward) is exactly counterbalanced by the pressure of the water beneath it (pushing upward). A boat doesn't float perfectly on the water surface but sinks partly into the water according to how heavy it is. The bigger the boat, the bigger the area of water beneath it, the greater the force of the water pressure pushing upward on it, and the more weight it can carry. Here's another way to look at it: generally speaking, an object will float if it's less dense than water (in other words, lighter than an equal volume of water) and sink if it's more dense (heavier than an equal volume of water). Imagine a block of lead the size of your arm dropped into a bathtub filled with water. An "armful of lead" weighs much more than an "armful of water" so lead sinks to the bottom of the tub straight away. But an "armful of plastic"—the plastic arm of a manikin, for example—floats because it weighs less than the same volume of water. Animation: Burning gas makes the air inside the balloon less dense, producing an upward force or lift. 1) A hot air balloon stays on the ground (or descends) when the air inside it is too cool. In this case, the weight of the balloon (blue arrow) is greater than the lift (red arrow). 2) When the air inside is a bit hotter, the balloon floats at a steady height because the lift force and weight are now the same. 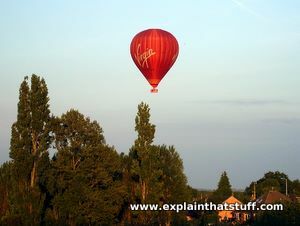 3) When the air is hotter still, the balloon rises because the lift force is greater than the weight. A hot-air balloon isn't like a rubber balloon tied in a knot: it's open at the bottom so air can still get in and out. That means the density of the air in the balloon can change while the pressure inside and outside is essentially the same. Hot-air balloons float because the air caught inside the balloon is heated up by a burner, making it less dense than the air outside. As the burner heats the air, it expands and some of the air escapes; that's what makes it less dense. Here's another way to think of it. You've probably heard people say that heat rises, by which they really mean that hot air rises. When you see clouds of dirty gray gas drifting upward from smokestacks, that's because the air coming out of them is hotter than the ambient (surrounding) air. If you could wrap a bag around the hot air entering the bottom of a smokestack, and seal it up, the whole bag would shoot upward and come out of the top before zooming off and up into the air. In effect, you'd have made a tiny little hot air balloon! Tiny balloons aren't actually much use, however. If you want to carry a heavy weight on the sea, you need a big ship: one that can displace more water can carry more load. In exactly the same way, you need a big hot-air balloon to lift a big weight—because you need to create more lift with a larger volume of hot gas. Just to lift an adult man's weight, you'd need a balloon about 4m (13ft) in radius with the air inside heated to a temperature of about 120°C (250°F). That explains why hot-air balloons are generally so large. How does a hot-air balloon work (in practice)? If you know that warm air rises, you could build yourself a hot-air balloon without knowing anything more about science—in other words, just by trial and error. What do you need to build a hot air balloon in practice? Three things: an envelope, a burner, and a basket. Photo: Envelopes: Look at the little people in the center of this picture and you can see just how big these envelopes are. Note the gores (the curved, vertical strips from which the envelopes are sewn together). Photo courtesy of NASA Glenn Research Center (NASA-GRC). To trap you some hot air, you'd need the balloon itself, which ballooners generally call the envelope. These days, it's usually made from a strong, light, durable, synthetic fabric such as ripstop nylon (nylon sewn into squares to stop rips and tears from spreading). The envelope is made in vertical sections called gores that are sewn together very tightly at the seams to make a strong, air-tight container that doesn't leak. There are holes in the envelope at both the top and the bottom: the top of the balloon, known as the crown, has a little hole in it called the parachute vent (or parachute valve) that can be opened by pulling on a cord, which allows hot air to escape and makes the balloon descend. The opening at the bottom (known as the throat) is immediately above the burners and reinforced with a skirt made from a fireproof material such as Nomex® to stop it melting or burning. The hot air that fills the envelope comes from gas jets fueled by propane cylinders (similar to ones you might use on a portable camping stove). Although some balloons have only a single burner, it's more common to have two or more, both to provide more lift and for safety's sake (in case one burner fails). Extra fuel cylinders are usually carried on the outside of the basket. Photo: Burners: Two propane gas burners are firing hot-air into this balloon. Notice the orange heatproof skirt protecting the envelope at the bottom, made from a material such as Nomex®. Photo by Todd Frontom courtesy of U.S. Navy. Photo: The main parts of a hot-air balloon. Photo courtesy of NASA Glenn Research Center (NASA-GRC) with annotations by Explain that Stuff. 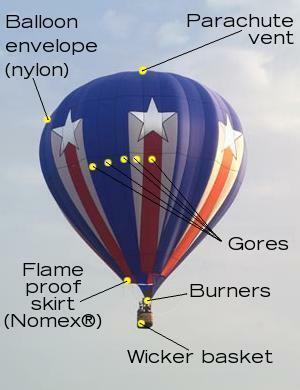 It's traditional for hot-air balloons to carry their passengers and cargo in a wicker basket suspended directly beneath the burners and the envelope. Wicker is light, durable, and squashy, so it helps to absorb some of the impact if the balloon lands too quickly. The basket is connected to the burners by eight strong ropes or chains. Ropes from the burner assembly connect to the envelope above by very strong, load-bearing tapes that run vertically up the seams between the throat and crown of the envelope. You launch a hot air balloon by unwrapping the envelope and laying it along the ground. You tie it to your burners and basket and use a large fan to inflate it with cold air. When that's done, you remove the fan and use the burners to heat the air until it's hot enough to lift you off the ground. Once you're airborne, all you can really control is whether the balloon rises or falls: you can go up by turning on the burners to heat the air in the envelope; you can go down by opening the parachute vent to allow hot air to escape and cool air to rush in to take its place. So up and down is easy, but what about steering? Once you've mastered ballooning, you'll find you can move sideways (very crudely) by making the balloon rise or fall so it catches air currents (light winds or breezes) blowing in the direction in which you want to travel. But it's all very bit hit-and-miss—and one of the joys of hot-air ballooning is that you never quite know where you're going to go! Sweeping gracefully over the local landscape is one thing, but what about gliding over the ocean or soaring over mountains? The more extreme your voyage, the more extreme the balloon you need to arrive in one piece! Modern high-altitude balloons, like the Breitling Orbiter, look like something out of space science; in the early days of aviation, lacking access to high-tech materials and technology, brave pioneers had to use sheer ingenuity to protect themselves instead. Back in 1925, aviation pioneer Ralph Hazlett Upson developed this improved balloon, with some interesting features for making long, record-breaking voyages at high altitudes. Artwork: An improved, high-altitude balloon from the 1920s. 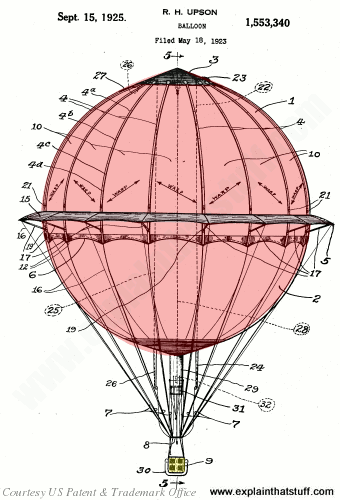 From US Patent 1,553,340: Balloon by Ralph Upson, September 15, 1925, courtesy of US Patent and Trademark Office. 1. and 2. Upper and lower halves of roughly spherical balloon. The envelope is made of lightweight, bleached white cloth with a white rubber backing to help reflect sunlight and protect against solar radiation, so helping to reduce the amount of ballast (balancing weight) needed in the basket. 3. Cone at the apex made of strong, double-ply fabric—includes ropes to the basket that the pilot can use to discharge any accumulation of snow. 4. Suspension tapes—made from reinforced, rubberized silk. 5. Equatorial rim—helps to damp vertical movement of the balloon (either sudden rising or falling), giving a smoother flight. It's designed to shed snow or rain and to shelter the lower half of the balloon. 6. Catenary band—a kind of reinforced "waistline" from which the load ring hangs. 8. Load ring—from which the basket hangs. 10. Gores—made of lightweight single-ply fabric, but with their warp direction arranged on the bias (diagonally), and alternating, for added strength. 27. Rip panel—a part of the envelope that can be quickly pulled open to deflate the balloon quickly on landing. 28. Snow line can be pulled to jolt snow free of the cone. Who invented hot air balloons? Illustration: Up, up and away—An early flight by the pioneering Montgolfier brothers. This one carried seven passengers (including the two brothers) and took place over Lyon, France, on January 19, 1784. Hand-colored etching created chés Enaut et Rapilly, rüe St. Jacques à la ville de Coutances, 1784, courtesy of US Library of Congress. c.200 BCE: Greek mathematician Archimedes (287–212 BCE) explains the idea of buoyancy: objects can float in fluids (liquids and gases) by displacing them (pushing them aside) so their weight is exactly balanced by the pressure of the fluid pushing up beneath them. Ships are supported by water pressure; balloons are held up by air pressure. 17th century CE: Irish-born chemist Robert Boyle (1627–1691) shows how fluids become lighter (less dense) when they're heated. June 1783: Two French Brothers, Joseph-Michel Montgolfier and Jacques-Étienne Montgolfier (1740–1810 and 1745–1799), make the first practical hot-air balloon using a linen envelope lined with paper. Instead of gas burners, they use a simple fire made of wood and straw. 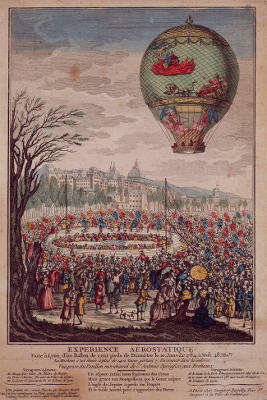 November 1783: Two more Frenchmen, the Marquis d'Arlandes (1742–1809) and François Pilâtre de Rozier (1757–1785), travel 9km (5.5 miles) across Paris, France in a balloon made by the Montgolfiers. The age of human flight has really begun! August 1859: Mail is carried across the United States by hot-air balloon for the first time. John Wise attmepts to ferry a package of 123 letters from Lafayette, Indiana to New York City, but has to abort when he reaches Crawfordsville, Indiana. 1987: British businessman Richard Branson and copilot Per Lindstrand become the first people to cross the Atlantic Ocean by hot-air balloon. 1999: Breitling Orbiter 3, piloted by Bertrand Piccard and Brian Jones, becomes the first hot-air balloon to fly around the world non-stop (in just under 20 days). 2002: Steve Fossett from Australia manages to circumnavigate the world by balloon in a mere 13.5 days. 2005: Indian Dr Vijaypat Singhania achieves a new altitude record of over 21,000 metres (69,000 feet), flying over Mumbai. Falling Upwards: How We Took to the Air by Richard Holmes. HarperCollins, 2013. An entertaining early history of hot-air ballooning. Hot Air Balloons by Christine Kalakuka and Brent Stockwell. Friedman/Fairfax, 1998. A colorful coffee-table tribute to the world of hot-air ballooning, including a brief history, types of balloons, and many color photos. Around the World in 20 Days: The Story of our History-making Balloon Flight by Bertrand Piccard and Brian Jones. John Wiley, 1999. Describes the authors' record-breaking, 30,000-mile, round-the-world balloon flight of March 1999. The Science and the Art of Hot Air Ballooning by John P. Jackson and Rudolph J. Dichtl. Garland, 1977. Quite hard to find, but worth tracking down on secondhand book websites if you're interested in the technical side of ballooning. How Do Hot Air Balloons Work? by Buffy Silverman. Lerner Publications, 2013. A simple, 32-page introduction for ages 7–9. Oh, to Slip the Bonds of Earth by Charles McGrath. The New York Times, October 31, 2013. A Times writer takes to the sky with a historian of hot-air ballooning. Indian sets balloon flight record: BBC News, 26 November 2005. Vijaypat Singhania claims a new altitude record of over 21,000 metres (69,000 feet). Ballooning: Odd Shapes Take to the Sky: The New York Times, November 19, 1986. An interesting article from the archives exploring the development of unusually shaped, novelty balloon in the 1980s.